The Internet never forgets. 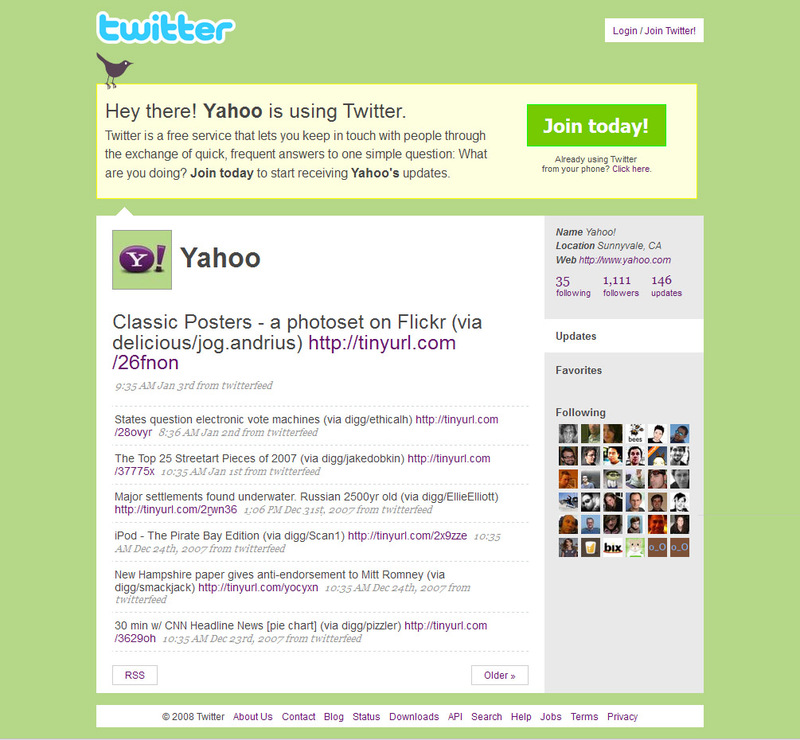 Yahoo’s Twitter page as it was in 2008, still live online today. Are your old, deleted pages preserved in the same place? So your Twitter account has carried your name for a year, but now you want to be anonymous? No problem: all you do is change your screen name, and maybe also your username. Some of your followers will probably still know who you are, but no one else can find you, right? Before we get into the detail of that, it’s worth bearing in mind that any Twitter account which has received a lot of tweets and/or belongs to a fairly well known person, may actually show up on Google or other search engines, to people searching for the individual’s best known identity. Even if that individual changes their identity, and even if they’ve NEVER used that identity on their Twitter. How the heck does that happen? It’s down to the way Google and the search engines assess content, based on backlinks, and anchor text. …The anchor text is “Twirpz account”. When Google crawls the Web, it uses the anchor text in links to determine what, or whom, the page they’re linking to represents. So regardless of what you call your Twitter, if your name is Richard Jones, and a range of significant sites post links to your Twitter using the anchor text “Richard Jones”, Google is likely to match your Twitter account with searches for “Richard Jones Twitter”. Strengthening this tendency further, all of the tweets people have sent to you, contain a link to your Twitter profile page. Let’s say you used a cryptic @username, and a simple “RJ” for your screen name. You haven’t given the search engines much to go on. But if a lot of the people tweeting you are calling you Richard, or mentioning Richard Jones with your @username tagged in, they’re effectively linking your name with your Twitter profile. Some of those who tweet you may also be mentioning the business you work for. If so, when people search Google for your name and your business name, Google once again puts two and two together and matches you with that search. It’s clever, but it makes the process of becoming anonymous on Twitter extremely difficult for relatively well known people. You can’t really control what others say about you, or how they use your name. About three years ago, I published a post called How To Find Twitter Users’ Previous Usernames. The article didn’t explore the detection of old screen names – only the @-prefixed usernames. But anyone searching for an old screen name is probably going to need to unearth the old usernames as a starting point, so I’d recommend reading that post for an essence of how the process works. Before doing so, please bear in mind that Twitter has changed its reply management since that piece was written, and the site now updates a user’s old replies to show their current username. However, this is not the case with mentions or proactive @messages, so people’s old usernames do still linger on Twitter. It’s not as easy to trace old usernames today as it was in 2015, but it can still be done. Once an old username has been traced, the resource most likely to unearth the relevant old screen name(s) is the Internet Archive, or Wayback Machine, as it’s otherwise known. This valuable utility preserves snapshots of web pages, as they were in the past. It goes right back to the 1990s, although, as you might imagine, the frequency at which it captures pages (and whether it even captures them at all) depends on those pages’ importance. The image of Yahoo’s 2008 profile page heading this post comes from the Internet Archive, although the timeline has been condensed down to sit in a more compact space. 1. If a Web URL is deleted, the Internet Archive de-lists it. BUT, Twitter re-uses URLs. So if you delete your Twitter account, and someone comes along and ‘recycles’ your old username, the URL of their profile page will be the same as the one you deleted. And as soon as your old URL re-appears under new ownership, all of the OLD captures of YOUR profile page are restored to the Internet Archive. So if someone wants to look at old snapshots of your Twitter on the Internet Archive, but you’ve deleted your account or changed your username, all they need do is create a new Twitter with your old username. That will bring back all the Archive’s old captures of YOUR page. Don’t you just love Internet privacy? 2. Even if you’re not at all famous or well known, your profile may have been indexed by the Internet Archive. In particular, if you’ve tweeted someone relatively famous and had a reply from them, the Archive may have picked up your account and captured your profile page at that time. Simply, a link to your account would have appeared on the profile page of the famous or influential person when they replied to you. If the Archive crawled their page at that time, it may well have considered yours relevant and crawled that too. 3. If any photos you uploaded (such as a profile pic) still have their URL live online, the Archive may display them on your historical page capture. 4. Whilst it’s unusual for individual tweets to be captured by the Archive unless they’re extremely significant, your old tweets may appear in archived timelines. Even if your own profile page was never captured, your old tweets could feasibly appear on other people’s Archive profile pages, courtesy of the retweet function. When a high profile user retweets you, your tweet is displayed on their profile page. If it’s there when the Archive takes a snapshot, your tweet is preserved. It’ll display even if your old username got suspended and cannot be recycled by anyone else. Of course, a self-styled online sleuth would need to have their wits about them to actually FIND your tweet on someone else’s profile page, but if they’re good detectives, it’s possible. The lesson? Don’t do anything on social media that you wouldn’t be prepared to put your name to. Even the fearsome threats of GDPR do not seem to have impacted on these ‘back door’ privacy wormholes as yet. So stay on your best behaviour. It’s probably the only surefire way to keep your reputation safe. Previous PostFive Ways in Which Social Media Worsens Our BehaviourNext PostHas Scareware Gone Mainstream?